Combine sugar, honey, eggs and salt, beat until thick, add the flour and liquid milk little by little, stir well. Heat the mold dorayaki or nonstick skillet diameter 8 cm, topical pan with margarine. Pour one ladle batter into the molds up to 3 / 4 high mold, allow it to surface perforated holes, cover the mold, and cook until browned bottom. Lift. Make filling: boiled red beans until tender, remove, drain, puree. Cook again until thick, put milk and sugar, cook until thick, remove from heat. 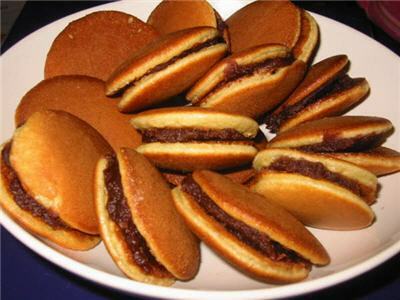 Rub the surface with the contents dorayaki until blended, cover with dorayaki again and serve.